Business Law is part of a major new national programme of highly developed texts and modules for undergraduate students following business studies programmes. It provides 100 hours of quality study to be used by students in a supported learning environment. This introduction to business law delivers the knowledge and skills required to understand the overall importance of the legal function in every aspect of the business organization and the ways in which the law affects the role of every manager, from marketing to personnel, in a business. It is designed for students of business as opposed to legal specialists so all the units are carefully sequenced and organized to ensure clarity and ease of use. Business Law has been written and developed by a highly experienced team. 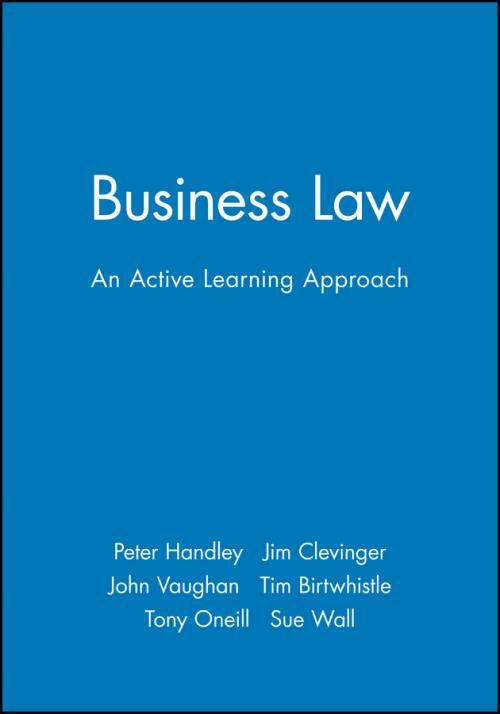 Extensively tested with students and using a range of questions, self–assessment exercises, worked examples and assignments, Business Law is the most effective teaching and learning resource available at this level. Legal Personnel and Legal Aid. Liability for Employees and Agents. What can go Wrong During the Making of a Contract. Non–Contractual Obligations of the Seller/Producer. The Duty of Care in Negligence. Other Aspects of Negligence and Product Liability. Liability in Respect of Employees. The Development of the European Community. The Functions of the Institutions. The Sources of European Community Law. The Integration of European Community Law at a National Level. Enforcement of European Community Law at a European Level.